I’m sitting and waiting for the healthcare vote. I’ve watched nervously over the last few days as the forces of Trump gathered in secret. It is clear they intend to deliver a savage blow to healthcare in America. As a result, it is clear that now, more than ever, we need single payer healthcare in California. SB562 is a Senate bill in the California State Legislature that proposes to provide free healthcare for all Californians. Single-payer health care is a system in which the government, rather than private insurers, pays for all healthcare costs. Healthy California is a campaign of over 4 million Californians committed to guaranteeing healthcare for the residents of our state. In a 2003 study, Americans spent 7.2% of our Gross Domestic Product (GPD) on health care. By comparison, it found that citizens in Europe, Japan, New Zealand, Canada and Australia spent less than 2.6. Their healthcare costs were covered by their governments. 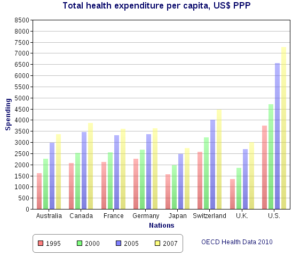 A 2010 study found that Americans continue to spend way more on our healthcare than other similarly-situated countries. Our failure to provide universal healthcare in America also hurts our financial status in the world. 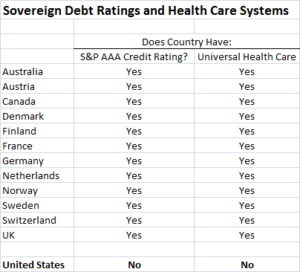 A comparison of our credit rating to other countries with universal healthcare makes it clear we need single payor healthcare. SB562 is a Senate bill in the California State Legislature that proposes to provide healthcare for all Californians. On April 26, 2017, the California Legislature moved SB562 forward. It would provide full healthcare coverage for all Californians. The advances from Obamacare would be folded into the new system. It will eliminate “co-pays” “out-of-pocket costs” and “deductibles.” These are the private expenses that are driving all of us to the poorhouse. SB562 will lower prescription costs which really hurt people when they are sick and need help the most. According to the U.S. Dept. of Health & Human Services, the infant mortality rate is one of the most widely used measures for the overall health of a community. Leading causes of death among infants are birth defects, preterm delivery, low birth weight, Sudden Infant Death Syndrome (SIDS), and maternal complications during pregnancy. Infant mortality continues to be a major problem in the U.S. although the rate is dropping. In Alameda County, 619 babies died prematurely between 2006-2012, compared to 56 in Marin. Alameda County’s infant mortality rate is consistently higher for Black and multiracial women than women in other ethnic groups. It is 3 times higher for Black families as white families in Alameda County, and almost that high in Contra Costa County. West Contra Costa County became a medical desert in 2014 with the closure of Doctor’s Medical Center. Residents of 8 cities, Hercules, Pinole, San Pablo, El Sobrante, El Cerrito, Albany, Richmond, Kensington and the surrounding incorporated areas have to travel to Berkeley or Oakland for emergency medical care. The current crisis in West County is the result of decades of racial injustice in healthcare and other social services in Contra Costa County. Reproductive Injustice is still pervasive in our healthcare system by race and gender.